Businesses in Australia who have registered a trademark are currently being hit by a scam that originates from a company that calls themselves WOTRA – World Organization for Trademarks. Their website is located at wotra-register.com. 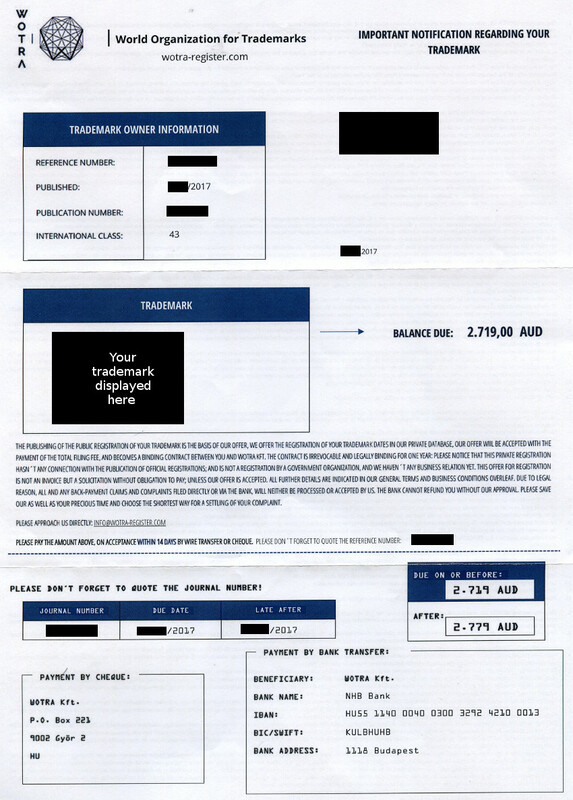 An example of one of their letters, which strongly resembles an invoice that requires payment, is shown below. Registering a trademark is not an instant process. The registration is done through the government agency IP Australia. After lodging an application and paying the appropriate fees, it can take up to 3 months before the trademark can be formally examined and accepted. If accepted, it will then be advertised in the Australian Official Journal of Trade Marks. There will then be a period of 2 months during which anyone can oppose the registration. If there are no objections after 2 months, IP Australia will then shortly register the trademark for you. As registering a trademark is usually a very infrequent process people go through, and as trademarks are renewed every 10 years, a number of organisations have sprung up that attempt to take advantage of this and potentially defraud trademark owners of significant sums of money. One common type of scam occurs when an organisation contacts you before your trademark renewal is sent out to you by IP Australia, offering to conduct the very simple renewal process at cost typically many times more than the cost of doing this yourself. An example of this is PTMO – Patent & Trademark Organisation. Another type scam, as perpetrated by WOTRA – World Organization for Trademarks, involves contacting owners of new trademarks during that 2 month period where people can object to your trademark, just before it is formally registered. Inside this envelope is a single page letter with the heading “Important Notification Regarding Your Trademark“. The letter looks very official, listing the trademark owner’s name and address, a colour picture (if applicable) of the actual trademark, the correct trademark number and the correct date that the application was lodged. The letter strongly resembles an invoice, with a “balance due” and detailed payment instructions. One could be forgiven for thinking this is a payment required for a trademark to be recognised world-wide, given that it is sent out by the very official sounding “World Organization for Trademarks”. The particular sample here has an amount due of $2,719, with a note that if it is not paid by the due date, it will be regarded as being “late”, thus a $60 late fee applies, taking the amount due to an eye-watering grand total of $2,779. So basically you are paying WOTRA – World Organization for Trademarks the very significant sum of $2,719 just to list your trademark’s registration date in their private database which has no benefit other than allowing people to see it on the website wotra-register.com. Also worrying is the fact this so-called contract is only for one year, so if you do end up paying, you may end up being billed $2,719 every year. While WOTRA do say the letter is not an invoice, it does strongly resemble one. There is a “balance due” section, a “due date” listed, and a section devoted to the penalties incurred if payment is late. If you receive a letter from WOTRA, it is strongly advised that you do not pay the $2,719 they request, as they have nothing to do with your trademark registration. Having a listing with WOTRA does not in any way mean your trademark is registered for world-wide use. If you have received an unsolicited letter from WOTRA requesting payment, you are encouraged report it via the ACCC’s ScamWatch page. For any general questions about trademarks in Australia, refer to IP Australia – www.ipaustralia.gov.au.